We’re proud to announce the milestone achievements of surpassing $4 billion in assets under management (AUM), and the expansion of BetaShares into Melbourne. Damon Riscalla joins BetaShares in Melbourne as National Manager, Adviser Services, bringing with him 21 years’ experience across the banking, insurance and funds management industries. 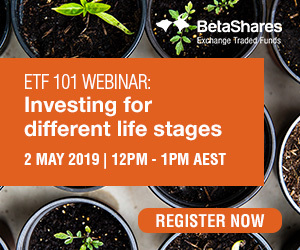 Since the launch of our first ETFs in December 2010, BetaShares has expanded considerably, now we are now managing a diversified family of 39 funds, covering a broad range of asset classes and investment strategies. As a leading participant in the Australian ETF industry, we’re committed to investing in education and client service and are pleased strengthen that commitment with recent additions to the team. To learn more about our full product range click here, or visit our Careers section and view current job opportunities.